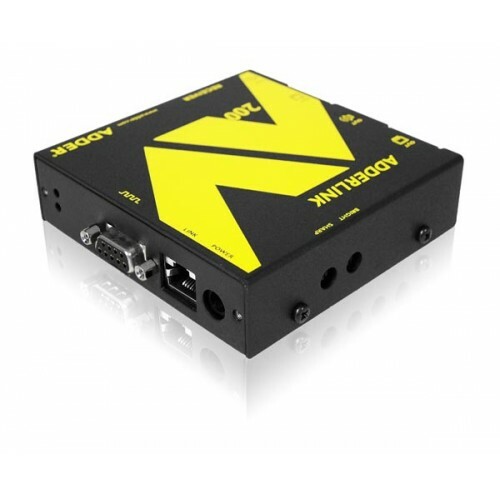 The new range ADDER AV200 series is an audio video extender that delivers high resolution crystal clear video and CD quality digital stereo audio across installations up to 2000ft in width or 1000ft point to point. It has full RS232 support video display panels that can be controlled and interrogated remotely, making the AV200 series the ideal professional Narrowcast Digital Signage solution. The AV200 series is supplied complete with ADDER DM (Display Manager) software. This advanced application makes controlling VDU power, video and audio possible from the transmitter, as well as allowing you to interrogate video panel status and dynamics. Due to ADDER's 'Open Architecture' policy, you can still use any 3rd party signage control system across the AV200 series. 1920x1080 at distances up to 100 metres/325 feet, 1280 x 1024 at distances up to 300 metres/1000 feet. Up to 300 meters/1000 feet using CATx (x=5,5e,6,7). Differential analogue signalling for video signals. Finely adjustable cable equalisation amplifiers enable the video sharpness and brightness to be independently adjusted using the dials on the side of the receiver units. Skew compensation adjustments can be made using the two rotary dials on the ADDERLink AV201R receiver unit. The first dial affects the relationship between green and blue colour signals, the second red and green. The cable skew is produced due to wire length differences between different twisted pairs in a CATx cable that arise due to the different twist rates used to reduce signalling cross talk. The amount of cable skew seen depends on the cable type used and the cable length. The ADDERLink AV201R provides up to 62ns of DeSkew with a fine 2ns resolution. This means that high-resolution video can be accurately DeSkewed even at long cable distances. The DeSkew supports 300MHz bandwidths, which means that the DeSkew function does not adversely affect the video quality. 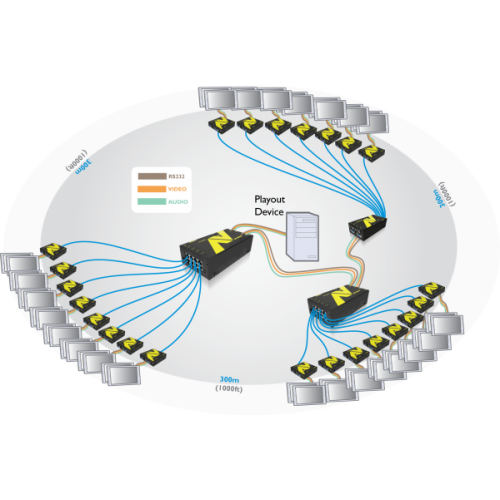 Included with AV200 transmitters, the Display Management Software gives users control and interaction with display devices over the integrated RS232 ports. This allows for bi-directional and automated communication with individual screens, groups of screens or all screens at the same time. The remote and local units are fitted with two indicators; red shows the presence of power into the module, green indicates the presence of a video input. Transmitted as digital signals to ensure high fidelity and low noise levels. Phase locked sampling clocks ensure that there are no unwanted clicks when no sound is being played. Both the local (computer-end) and remote (display-end) units may be rack mounted in the ADDERLink AV Series rack mount chassis. The chassis enable 16 units (ALAV200T, 200R and 201R) or 8 units (ALAV204T and 208T to be mounted in 3U of 19-inch rack space. The units are rack mounted using the optional rack mount faceplate.